The Hunguest Hotel Panorama awaits the guests who are looking for health cure and recreation all the year in the proximate neighbourhood (only 100 meters) of the world-famous thermal lake of Spa Heviz. Our hotel is located in the center of the town, the Pedestrian Street, Cinema, Museum, Thermal Lake, Saint Andreas Hospital & Medical Center, and the Bus-station can be found only 200 m from the house. Revive yourself at our beauty island where hairdresser's, cosmetic treatments, manicure, pedicure, Chinese naturopathic programm, infrasauna, refreshing massage, and fitness room can be found. Guests longing for active recreation will have several excursion and sports facilities in the neighbourhood. Try our full-body refresh massage which decreases the feel of tiredness, it has some reassuring effect, and is a very good way to relax of course. Our house has a special location because it's in the neighbourhood of the Saint Andreas Hospital & Medical Center, this building is easy to reach through an indoor corridor which was built between the hotel and the hospital - this is one of the advantages of Hotel Panorama. Here can our guests take a medical cure of high standard. These cures are controlled by serious professional specialists, the treatments are based on the healing effect of the thermal lake's water and are very useful to cure locomotor diseases. Medical services: electrotherapy (interference, ultrasound- and magnetic therapy), balneotherapy (effervescent bath, whirlpool bath, alectric bath, alternating bath, 4-cell bath, underwater jet massage), mud pack (sulphurous, paraffin), weight bath, medical massage, medical gymnastics. Restaurant Márvány offers international, Hungarian traditional and vegetarian foods to our guests in buffet style or a'la carte. In the lobby bar ( 08:00 - 23:00 ) there is Live Music from Monday to Friday evenings. We offer coffees, teas, cakes, cocktails and drinks. We can offer a conference room for 250, and a smaller section room for 25 person. Technical equipments: video, television, amplifier, flip-chart, podium, telefon, fax, pulpit, microphone, public address system, projector. In the refurbished main building ("A" *** ) can be found 205 three-star class room. 122 are totally modernized Superior, 80 from Classic category, and we have 3 Apartments for handicapped guests (these rooms are without doorsill, have wide doors, unhindered bathroom, easy to get with wheel-chair). 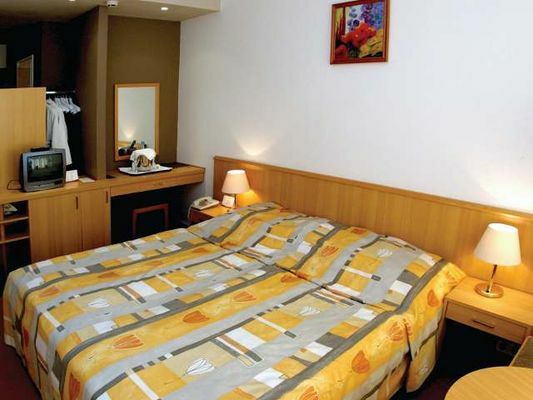 Every room is equipped with television, phone, minibar, bathroom with shower and toilett, balcony. What is the difference between the Classic and Superior category? Our guests put this question to us recently. The main difference is in the tpye of the furniture. The Superior rooms are equipped with newer wardrobe-system and these rooms are located on the 5-13 floors, the Classic types are on the 1-4 storeys and are equipped with older furniture. • Full board is available at 3800 HUF per person. • Garage is available for guests at 900 HUF per car per day. Services: accommodation with half-board, daily entry to the indoor bath (3 hours), Thursdays Hungarian vesper or light opera vesper, evenings live music in the lobby bar, use of safety deposit box and bathrobe.